Lacoste is a French apparel company that sells high-end clothing, footwear, perfume, leather goods, watches, and most famously tennis shirts. The company can be recognized by it’s green crocodile logo. 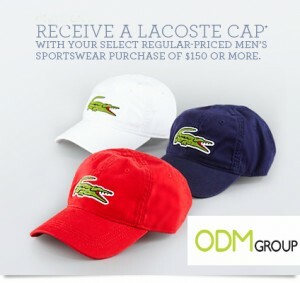 Lacoste is running GWP promotional campaign at the moment, offering the promotional caps to their customers. Simply spend $150 or more and this cap is yours for free! How can these promotional caps improve brand recall? Promotional caps are among the best marketing tools you have at your disposal. They have high perceived value and great visibility. Anyone that comes across someone wearing one of these promotional caps will become more familiar with your logo and better aware of your business. While the perceived value of promotional caps is very high, they are very affordable and can be designed for any type of business. In addition, caps come in different styles and colours, they can be printed with your logo or any type of information. Furthermore, promotional caps are great for use at trade shows or as corporate gift. These caps can be a great addition to a retail company uniform, or used as a way to promote solidarity between employees. Custom logo caps are perfect for business promotions, schools and travel agencies. They can easily be matched to other promotional clothing. Companies can give them away to customers or staff or hand them out to prospects at trade shows. When it comes to investing on a promotional item for your business, promotional caps have an extremely high return on investment. Французская компания Lacoste, проводит акцию для своих покупателей. При покупке мужской линии одежды от $150 и более, Вам подарят стильную кепку с логотипом Lacoste. Кепка – очень удобный и очень популярный головной убор, а также прекрасный рекламный носитель!